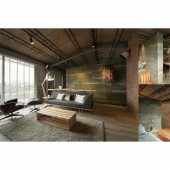 With “subtraction”, the transformation of rusty rooftop became maisonette . By minimizing to the essentials, the house corners that are deluged with scenic views and natural lights in the living hearth yield to the augmented balcony and terrace for embracing the green horizons atop the park. Exploited with the industrial production of bricks, concrete and steels, the original walls and trusses are retained to structure the functionality of interior layout in elaborate textures. The maisonette has an old rooftop addition. It is very common for the Taipei walkups, portraying the disorder and autonomy of living conditions. The design wants to preserve this past. Not only the original truss and decking of the rooftop addition are preserved, but also the traces of deteriorated walls are saved with clear coating. To warm up the industrial vibe, planks of pallets are reused throughout the penthouse, forming the furniture collection and the backdrop wall with color stripes. While the brick and fair-faced concrete walls help anchoring the new and old elements, balconies and roof deck bring in views of the city and nature. This is an old maisonette on the top floor of the apartment, as long is covered, so that it has the landscape can not show up. By the subtraction of design, the house opened the windows to allow sunlight and air to enter the room, yield to the augmented balcony and terrace for embracing the green horizons atop the park, and even the Taipei 101 Building. And 'Green Living’ permeates into the design details in terms of ‘recycling’, including bedroom and furniture in the interior settings. The total area of the property is 172 square metres. 1.Using the recycled flakes of Taiwan cypress in the wall of the bedroom. 2.the grilles in a variety of dimensions flank the corridor for a fresh interpretation of the contemporary sliding door. 3.the rooftop space is triangularly shaped by recycled metal sheets. 4. Using the recycled pallet modules in the making of furniture such as chair, stool, coffee table, bed stand and bed frame. Unlike the reception role of parlour designated in the conventional designs, the kitchen/dining area becomes the portal junction for either channeling to private spaces and scenic corners or being the resting kiosk to promote host-guest gathering and mingling. In particular, the dining area embraced by the stylish cellar and the L-shaped kitchen can inspire the most pleasant aroma to enjoy free chatting and premium meals. Image #1: Photographer Benjamin Tsou, The Maisonette-Aged but Tepid, 2015. Image #2：Photographer Benjamin Tsou, The Maisonette-Aged but Tepid, 2015. Image #3：Photographer Benjamin Tsou,The Maisonette-Aged but Tepid, 2015. Image #4：Photographer Benjamin Tsou,The Maisonette-Aged but Tepid, 2015. Image #5：Photographer Benjamin Tsou, The Maisonette-Aged but Tepid, 2015. Sharho.com(Taipei) was founded by Mr Ta-Wei Yu in 2004. Mr Yu is a distinguished and famous designer who is passionate in projecting excellent architecture & interior programs.”Do appropriate design measurably for every customer/guest enthusiastic in the same idea and persuasion. ”, which accurately and precisely explains sharho.com constant chase in the career of design and promise to be responsible for each client. His works got recognition for every client, Chinese Society Of Interior and Asia Pacitic Federation of Architects/Interior Designers. Revitalized Past Residential House by Ta-Wei Yu is a Nominee in Interior Space and Exhibition Design Category. · Click here to register today inorder to be able to view the profile and other works by Ta-Wei Yu when results are announced. Revitalized Past Residential House by Ta-Wei Yu is Winner in Interior Space and Exhibition Design Category, 2015 - 2016. · Press Members: Login or Register to request an exclusive interview with Ta-Wei Yu . · Click here to register inorder to view the profile and other works by Ta-Wei Yu . Did you like Ta-Wei Yu's Interior Design? Did you like Revitalized Past Residential House? Help us create a global awareness for good interior design worldwide. Show your support for Ta-Wei Yu, the creator of great interior design by gifting them a nomination ticket so that we could promote more of their great interior designs.